So. I've been asked to write about this Many.. Many.. MANY times now, and I just never have put it into words.. but I'm going to try to take the time now to do that. This is my OWN analogy, but everyone I share it with says "YES! Thats it exactly!".. So now, if you hear me say, "Thats because they are lemon" you will know what I'm talking about. Many years ago, I realized that I was NOT like most women I knew. Not that I was a bad thing, or they were a good thing.. it was just really different.. Even when I was growing up.. 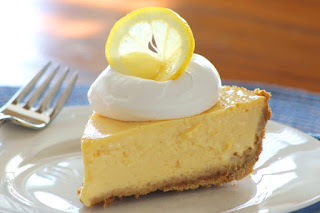 I realized my goals for myself were not the norm, and the expectations I had for myself were not the norm.. Now I know why this is.. 1) I was an ENTJ on the Myers Briggs.. and 2) Because I was a lemon Pie. First Pie is Cherry. Cherry pies (Also could be considered Apple Pies) are delicious. They are by far the sweetest pie you will ever eat. Everyone loves cherry pies. They are an american staple. They look pretty, are arranged pretty, they taste deliciously sweet. Cherry pies always look like they have it together (and even if they don't, they aren't going to tell you up front) because they are always positive, cheerful, upbeat, uplifting, and Precious. 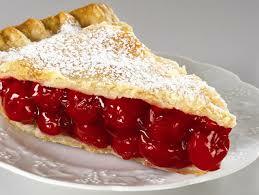 Cherry Pies will use words to describe their husbands like "Cute" and their kids are "delicious".. They will often say they are "so in love with".. XYZ. They will use hashtags like this #blessed #myeverything #precious #perfection. They describe times in their lives as Perfection, and even if its not Perfection, that is the illusion they are going to give you. Cherry Pies will be able to make breakfast meals in the shapes of disney characters and Fruits in happy faces across their kids dinner plates. They are amazing at Pinterest activities. You will be jealous of how they make everything look so easy, You will wonder if they ever really have any problems with their kids or their husbands, because they really do look like they have it all. They probably decorate their desks at work with festive things, or adorable pictures of their family, or cute sayings.. Cherry pies are super-high feelers. They are all about sharing their feelings, and encouraging others to share theirs. If Cherry pies are going through something, and admit it to people, everyone will surround them, hug them, and cry with them. Their family pictures are things dreams are made of. They have professional pictures taken a lot. Sometimes they match as a family.. because somehow.. Somehow.. that Cherry pie managed to convince her kids and husband to Coordinate.. got them in the car, and got them to all smile like a magical family.. THEN converted that picture onto a Canvas and draped Fleur De Leur's around it in her living room to match her pristine kitchen that has White Cabinets. Cherry Pie's love Pottery Barn. In fact their houses look like you just stepped into a Pottery Barn Show room. Nothing is out of place. It looks like they spent hours cleaning, and then when you see them they will look like the perfect Step ford wife.. With magnificent shiny lips, and pristine Hair. Its fantastic. They know how to wear, and live in high-heels. They throw amazing parties that everyone wants to go too, because they usually have amazing treats at them. They know how to make Champagne Punch, and Wedding Punch.. They have Fiesta Dishes.. They like to work out, and they even look like they like to work out.. which is incredible. Overall.. Cherry pies are the bomb. I mean like I said, Everyone loves Cherry Pies.. (Cue the Warrant Song here).. The Next Pie is the Rhubarb Pie. 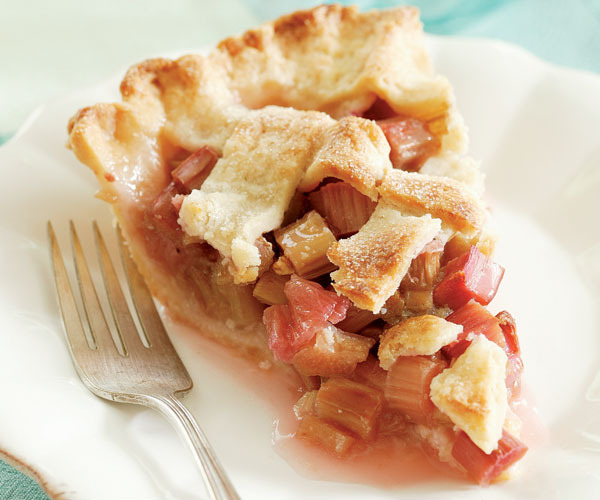 Rhubarb pies are also delightful sometimes, but they are a bit confusing. Are they a fruit? A root? A Vegetable? Do they go in Pies? Smoothies? They seem to pack a punch of antioxidants, so that is good news.. but no one ever really fully understands the Rhubarb. Rhubarbs are seasonal, and you don't see very many of them. They are a rare commodity. They have pretty distinct views that they understand like a science, but if they try to explain them to someone else, we are all left scratching our head. They have different ideas about the way the world works. Some of them make sense to other people, and some of them only make sense to themselves.. the Beauty of the Rhubarb, is they don't usually care! Rhubarbs are their own people, that like to do their own thing. Sometimes they hang with a crowd, sometimes they don't. They can be content doing either.They are smart, sharp, and Witty. Its hard to get much past a Rhubarb.. They like to reflect on situations and think about what they would do, or how you should possibly do it. Sometimes you will think their advice is crazy.. other times Spot on. You won't always understand if they are being sarcastic, or serious.. but they will amuse you either way! Next Pie is near and dear to my heart.. Because it is Me. Lemon Pie. Lemons are very tasty in their own right.. but when you first bite into one.. Wowza! It slaps you right in the face with a squirt of sour sauce! That pretty much describes me to a tee! Lemons are pretty witty, entertaining, and they are one to say what they think. Sometimes its filtered with some sugar, like say, Lemonade.. other times, its like biting into a sour Lemon fruit.. Either Way, Lemons are always going to be a Citrus. Lemons cannot ever be Cherry Pie. Lemons cannot ever offer cherry pie advice. If you ask a Lemon what to do in a certain situation in which the Lemon thinks you are doing something dumb.. the Lemon will say "Thats dumb".. They don't really sugar coat it, b/c you see, the lemon has no sugar.. So they just can't. Its not that they don't want to, but a lot of the time they are just not able to do it. Lemons are probably not going to be at many social activities. Not because they aren't social, just because they don't care that much about going. Lemons are not worried about what people think about them. In fact, they are usually trying to do something out of the ordinary.. If they wear something that no one else wears, and someone makes fun of them for it.. the Lemon will not care. Lemons are not high-feelers. In fact, you will sometimes have to remind the lemon to have some feelings.. The Lemon is really not interested in making tons of friends, or impressing people. They just Usually entertain people by making them laugh, or saying exactly what someone else WANTS to say, but will not. Lemons can be tender.. but its not common nature for them. Usually its about specific things.. For me, its old people, animals, and Music. I'm super emotional about Music. So usually you will find a couple of things that make Lemons tender, but it will be far less than you would find with a Cherry pie. 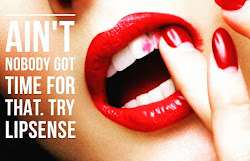 And.. even if the Lemon is tender about something, chances are you won't see that side anyway. They are really good at hiding it, in case you didn't notice, the rind of a lemon is pretty hard to get through. ;) But.. if you ever do, they will be loyal, and a friend for life. They will also be glad to spew sour from their mouth to defend you in a situation.. no matter what pie you are. But.. if you can stomach the sour of the lemon.. They will make you Laugh! They will even say inappropriate things that you are thinking when no one else will say them. They will entertain you with sarcasm, wit and hilarious stories, but the stories will always have a twinge of sour related to them! Lemons can be some of your most funny friends.. if you can stand the sour humor! The next pie on the Agenda.. and really the most versatile Pie on the Pie Chart.. is the Key Lime Pie. Key limes are amazing, because they have the ability to play to whatever audience they are with. Meaning, they are the perfect mixture of both Cherry and Lemon. Key limes may have a few rhubarb tendencies, but normally they fit in pretty well with a group of cherry pies or a group of Lemon pies, or even a group of Rhubarbs. Whoever they are with, is what kind of mood they will be in that day! If Key limes go to a party with Lemons who are all talking about how ridiculous the world is these days, they will chime in about how ridiculous it is too! But.. on that same vain, if they go to a gathering where all the cherry pies are talking about how much fun it is to make cornbread from scratch.. they will also chime in about their favorite cornbread recipe. Key limes love the positivism that Cherry pies bring, but they also know that they are Probably more realistically thinking like the Lemon, but they would never say that, because it would hurt the Cherry pies feelings! Key limes do not like to hurt people's feelings! They like everyone to be happy, and they will go to great lengths to smooth over a disagreement in the group, or "Fix" the situation if someone is upset. Key limes like to go to social events where they are going to feel welcomed. They love Community and events to go to, and things to participate in, because they love "Joining" in. They want people to like and accept them, and most people usually do, because the key-lime is a little sweet, with a little sour. 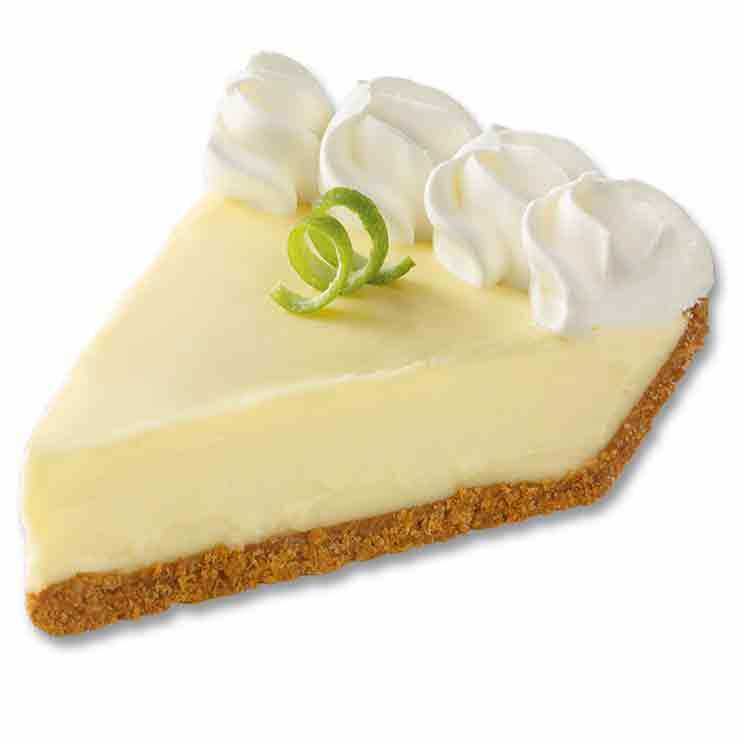 Sometimes the Key lime is not exactly sure what side they like the best, so they are good at staying in the middle and making sure everyone has what they need. They throw great parties because they meet everyone's needs, and they usually love entertaining.. but then are dead tired AFTER entertaining! They usually get volunteered to do things because they don't say "NO" to people. They don't usually love confrontation, so they will say "YES" to avoid someone getting their feelings hurt, or having to confront someone else to do the job. Key-Limes are what make the world go round! This bring us to the final Pie.. Minced Meat. Now.. we all know a minced meat pie. This is the Debby Downer of Pies. No one really gets excited to see this Pie on the table, except other minced meat lovers. Whenever you talk to a minced meat SOMETHING is always wrong. They are never satisfied, and they don't have any problems telling you about it. They have usually been 'wronged' some way by 'the man'.. They don't always see their blessings, and forget about counting them! 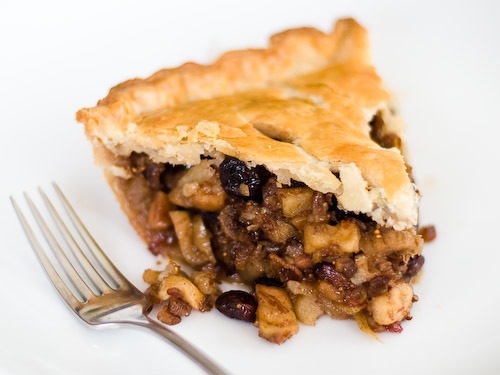 Minced meat, hopefully, is a "short term" pie.. We all go through times of "Minced meat" but hopefully we all come out of it.. because Minced meat pie is not really someone wants to be around. Minced meat goes from one dramatic event to the next. If you offer them advice on how to fix it, they will usually ignore the advice you give them, because they honestly don't want to fix the problem, they want you to feel sorry for them. They are Martyr's in life. Its never their fault, always someone else's, because they have just been dealt a bad hand in the deck of life cards. Minced meat's will feel that life "Owes" them something just for living, as opposed to doing something to make the situation better. Minced meats will ask you for advice.. then never take it.. Now, Like I said.. hopefully.. HOPEFULLY.. this pie is temporary.. and eventually the Minced meat will come back around, and find some goodness in the world.. Otherwise they will have very few friends, lol. People will hang around Minced meat for awhile.. try to help.. offer prayer and suggestions.. but they can't stay there forever. They will also not continue to offer advice to Minced Meats if Minced Meat has NO intention of ever getting out of the never-ending negative circle.. So if you are minced meat, or know someone who is.. try to get them out of this flavor pretty quick! The Best part of the pies, is they work together pretty good. Lemon's and Cherry's love sharing advice and suggestions with each other.. IF.. You understand that you are going to get cherry advice from cherries, and lemon advice from Lemons. Don't ask me to give you cherry advice. I'm a citrus. I'm not capable. The closest you will get is a grapefruit piece of advice, which is still going to be sour. Minced meats are going to ask you for advice, but not take it.. so that will get super frustrating quickly. Rhubarbs are going to give great advice, and probably advice you had not thought of before.. So enjoy each other, and don't try to make someone fit into a pie they are not. Celebrate the pies that you are! So there you have it.. Now you should be able to enter a group of people, and know exactly who you are talking to! I need to come up with a quiz you can take to find out what pie you are.. but my guess is that most people know, and that most people know what kind of pies their friends are. 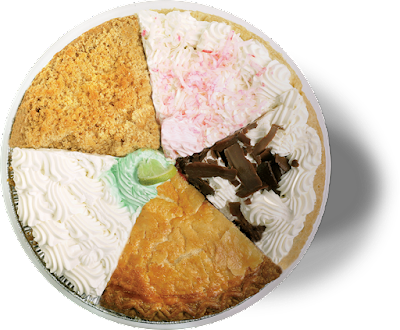 Whichever pie you are.. celebrate it! (except Minced meat, and if you are that one, find a way to get out of being minced meat).. because we are all different, we are all delicious, and we are all needed at Thanksgiving and Christmas! So Eat, Drink, and be merry! OH Timehop.. You Silly app! You make me feel so old when I look at you! Isn't that crazy.. when you see those things come up on your Facebook post.. Like "Brandon & KC Celebrate 8 Years of friendship".. WHAT! That seems crazy..
Today was the Girls first day of Mothers day Out At Crossings.. 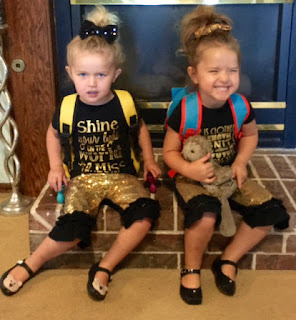 They were mostly excited for their new Nap Mats, and Backpacks.. with snacks in them. I chose to send them to Mothers day out, as Opposed to an actual Pre-K because of the days/times/Money.. It was more financially possible for us to send them to MDO because we are already paying for a full time nanny.. And since most 'schools' are not working parent hours, we just decided to keep the nanny, and then also do Mothers day out so they could hang out with other kids, and enjoy a day out a couple of times per week. 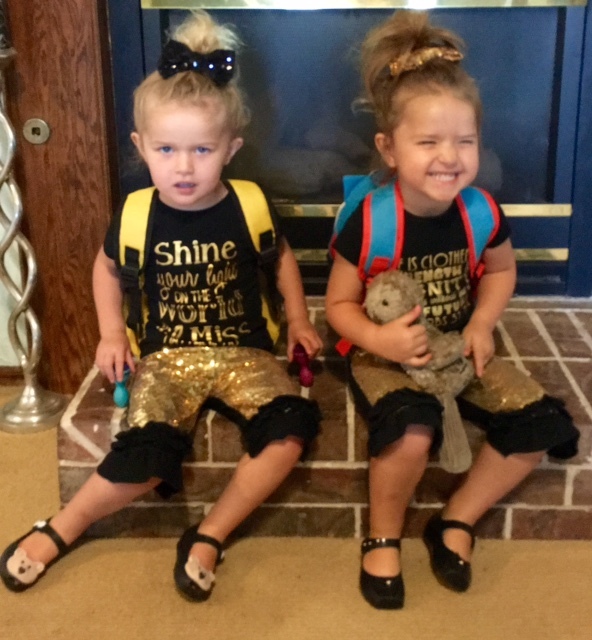 They looked pretty cute as they went, and one of their teachers is a girl in my Sunday School class who has twins too, Miss Danielle.. So I'm hopeful she'll tell me if they act like little jerks.. This past weekend was Rodeo weekend in Western Oklahoma.. and Gigi & Pa took the girls.. 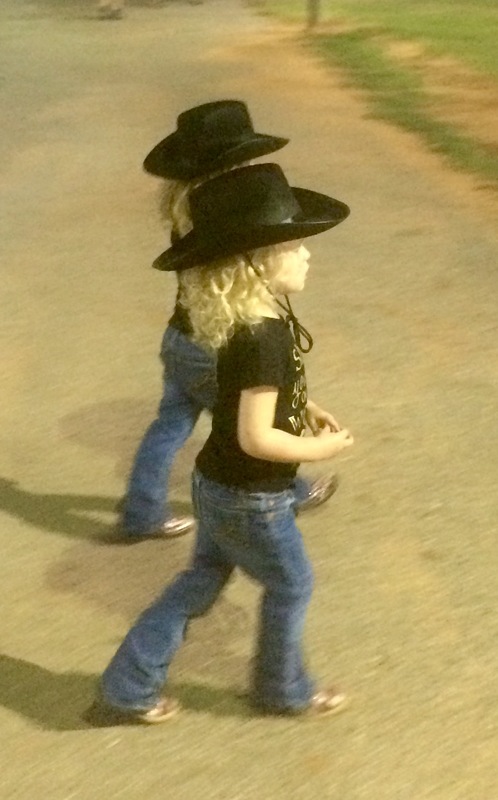 They had a GREAT time, and made it through the WHOLE rodeo (not getting into bed until 11pm!).. They had a great time though. Cille got to eat chicken on a stick, and they both found an inflatable Owl (for Cross) and an Inflatable Spiderman (For Cille).. They had box seats up high and they both loved watching everything going on below them. The Rodeo is a BIG deal in Elk City.. I always went to it when I was younger, so the girls are starting the tradition off right! nice. 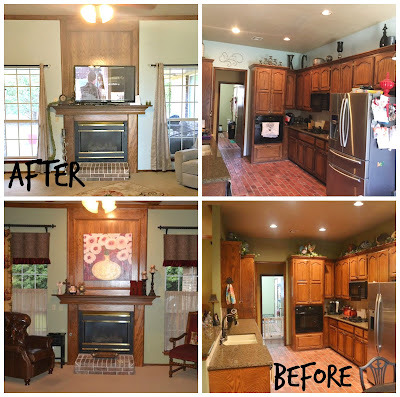 You can't tell that much in the pics, but its made a HUGE difference in the way it lightens up the place. That paint came from Sherwin Williams, and it was truly a One Coat.. and its reflective property was 75%.. so it really made a difference. ON Saturday.. Brandon and Rachel Came over.. and.. We recorded a podcast! Now.. before you get too excited.. IT was pretty sucky.. But I have full faith we will get better. This was really just more of a 'get to know' you podcast.. So we are going to record another one on the 24th. We are all excited because its something fun to do.. and I need a hobby and a way to be Creative! So more to come on that..
Jordan and I went to Western OK on Sunday after Church.. Man, speaking of church.. Sorry, but I just have to tell you.. we got a new Choir Director, and a new Orchestra Leader, and just when I thought the music could not get any better at Crossings. IT DID. I am blown away every Sunday by something magical they do. Such a blessing.. Ok, anyway.. we went to Moms house on Sunday and grabbed the girls, then went to my dad's house. They had a big time playing outside in the 'Fort" that Pops had built, and eating yummy chicken bites from the Red Barn. 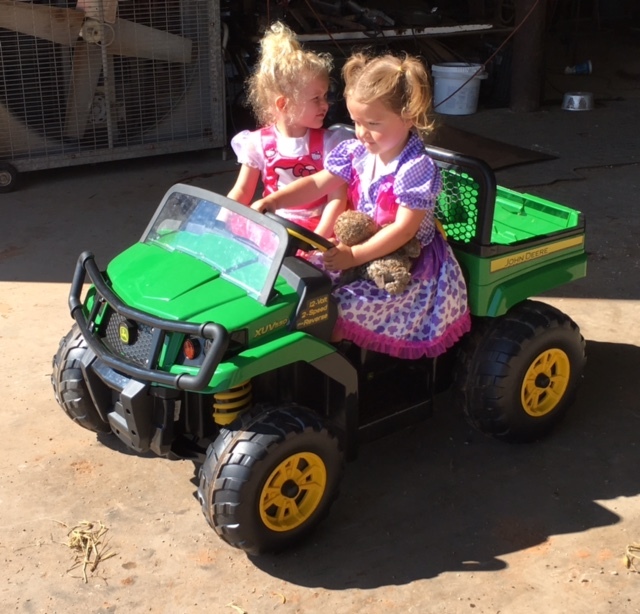 Pops & Grammy have a whole room full of toys, so the girls love running back there and literally tearing EVERYTHING up. We also went to see my Grandma Betty, who is in the hospital.. and the girls wanted to wear Costumes.. So Cille put on a Hello Kitty Ball Gown, and Cross had on her Western Girl outfit. They were pretty cute and made grandma smile, even though she was cussing the staff at the hospital. lol.. So we had a great weekend. My birthday is coming up on the 19th and I don't even care. I remember when there was time when my birthday was a big deal.. Like Limo ordering, party having, champagne poppin big deal.. but now all my party planning efforts are spent thinking of Michael Jackson birthday parties for the girls.. And Honestly that is pretty fun, so I'm not sad about it. There was a time in my life when I had PLENTY of ridiculous birthday parties, and the pictures to prove it! I can tell you, not a day goes by that Jordan and I ever feel "Equipped" to be parents to twin girls. But when I read that verse, I know that God knew what he was doing when he gave them to us, and we ARE Equipped! Even when we feel like we are failing, or struggling, or screwing it all up. And as parents, we all feel like that everyday.. So.. Trust in the Lord folks.. He knows what he's doing! Or in my case, I'm sure hoping he does!